Our research covers a broad range from advancing research methodology, to the actual engineering of readily usable tools, to the application of such developments to concrete research questions in medicine, psychology, or cognitive neuroscience — because there is nothing worse than a solution without a problem. Most recently, our main research focus lies on studying the representation of information about, and for interacting with, the environment. We believe that ecologically valid conclusions about these representations can only be drawn when they are also studied under conditions of real-life complexity. Hence our aim is to combine controlled experiments with complex natural stimulation in order to validate our findings. This is a long-running project that aims to built a unique resource for studying the brain's natural behavior. It combines brain imaging with other data acquisition techniques to capture a versatile recording of the human response to a prolonged complex natural stimulus, the motion picture "Forrest Gump". We invite anyone and everyone to participate in this decentralized effort to explore the opportunities of open science in neuroimaging. One of our goals is to document how much (scientific) value can be generated — from the publication of scientific findings derived from this dataset, algorithms and methods evaluated on this dataset, and/or extensions of this dataset by the acquisition and incorporation of new data. Overview of functional (top), and structural (middle) brain imaging data, as well as annotations of the complex real-life stimulus (bottom) that are available through the studyforrest.org project. Since 2014, a number of datasets have been publicly released for unrestricted use, covering functional and structural brain imaging, eye tracking, physiological recordings, and numerous annotations of the structure of the movie stimulus. For up-to-date information on available data, funding, and our many collaborators, please see the project homepage. Data are key ingredients of science, but interesting data are often scattered across many different locations, with heterogeneous access methods, and are packaged in a multitude of structures and formats. This makes it hard to discover, obtain, and re-use existing data. 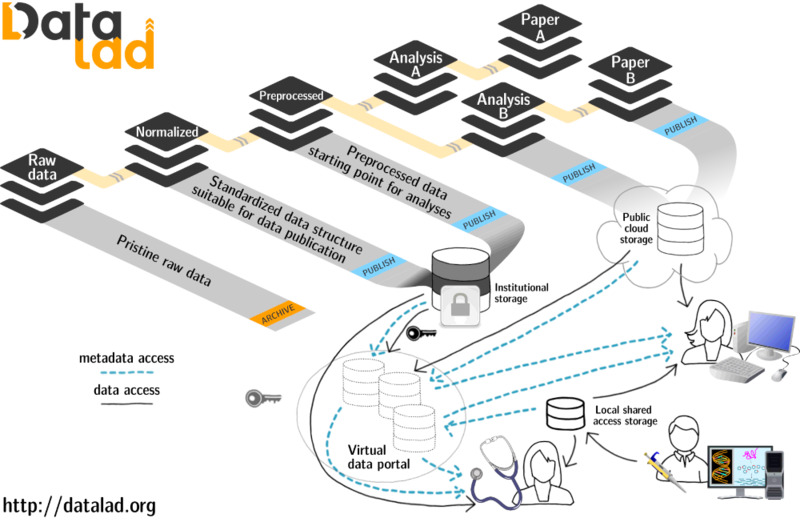 DataLad is a software engineering project that aims to deliver a data management tool that aids data discovery, to simplify and homogenize access to data across many providers, and to re-share data with a community. One could think of DataLad as "Git for collections of datasets". As such, this software is ideally suited for projects like our studyforrest effort. It applies the successful model of collaborative, decentralized open source software development to the domain of managing and sharing (scientific) data. DataLad facilitates and homogenizes data exchange between peers, and tracking of resources from data portals. It is data format agnostic and exposes meta data to ease data discovery. Access to sensitive data is supported via configurable authentication schemes. This project is executed in collaboration with Yaroslav Halchenko (Dartmouth College), and is co-funded by the US National Science Foundation (NSF; 1429999) and the German Federal Ministry of Education and Research (BMBF; 01GQ1411) as part of a US-German collaboration in computational neuroscience (CRCNS). An investigation into the perception and neural representation of primary rewards (i.e. tastes) of their visual correspondences (secondary rewards) and of their (mis)matched combination in the human brain. The aims of this project are: 1) to identify the motivational, hedonic, and category-specific representations (sweet, sour etc.) of primary rewards; 2) to identify the influence of secondary reinforcers on these representations; and 3) identify the effects of over-learned and novel visuo-gustatory correspondences on these and their functional interplay by means of univariate fMRI-approaches (plus functional connectivity), classification analysis, and functional hyperalignment. This project is a collaboration with Toemme Noesselt (Magdeburg University), and is funded by the German Research Council (DFG) as a part of the Collaborative Research Center SFB 779 in Magdeburg. In this effort we seek to identify the nature of attentional preferences of cognitive behavior, in terms of function (how it affects our behavior), physiology (how it is implemented in the brain), and time (how it is affected by learning/selection history). Specifically, what preferences can it hold, how do these change as a function of experience, and what are the neural codes underlying these representations? This project is a collaboration with S. Pollmann (Magdeburg University), M. Eimer (Birkbeck College, University of London), and C.N.L. Olivers (Vrije Universiteit Amsterdam). It is co-funded by the German Research Foundation (DFG; PO 548/16-1). It is possible to decode information from brain activation patterns with multivariate analysis procedures. Despite this fact, little is known how neural codes vary across individuals. The main disadvantage of current decoding approaches is that they have to be built for each brain individually, because it is difficult to bring two brains into alignment at a fine scale. This project developed methods that allow for the detection and description of common neural representations. Individual brain activity patterns are projected into a common high-dimensional space, to build models of representational spaces of cortical areas that are valid for a range of stimuli and across individuals. This includes complex cortical networks that do not respond consistently on direct stimulation (e.g. social cognition). A collaboration with the groups of James V. Haxby (Dartmouth College, USA) and Peter J. Ramadge (Princeton University, USA), this project was funded by the German Federal Ministry of Education and Research (01GQ1112) as well as the US National Science Foundation (1129764). This project focused on the development and validation of new experimental and neuro-computational approaches for the investigation of the neuronal processing of sensory input to the human visual cortex. Novel approaches to decode cortical processing with functional magnetic resonance tomography (fMRI) are developed and applied to the analysis of the visual cortex. On the one hand spatial high-resolution fMRI approaches are established, validated, and optimized. On the other hand, multivariate data-analysis approaches are adapted, optimized and applied to the analysis of fMRI data sets. These methodological developments open up a wide range of applications, not only to deepen our understanding of the healthy visual system, but also to investigate pathophysiology and plasticity of the visual system for the optimization of future therapeutic strategies. A collaboration with Prof. Michael Hoffmann (Visual Processing Lab, Eye-Clinic, Magdeburg), this project was funded by the federal state of Saxony-Anhalt as part of the project "Center for Behavioral Brain Sciences". A collaboration with Prof. Stefan Pollmann (Experimental Psychology, Institute of Psychology II, Magdeburg), this project was funded by the German Research Foundation (DFG; PO 548/10-1).